Plan B: Luke's Theater for Plucky Ruthless! The view from Ed's front door. Rubin photos. 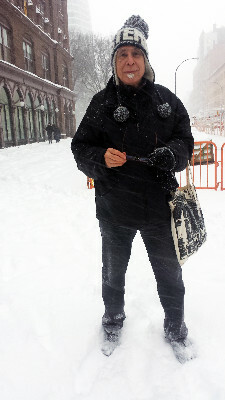 Theatre critic Fast Eddy Rubin braving the elements. So far, my two favorite days this year was New Year's Eve which I spent alone. I took myself to the movies and out to eat. It was a Pig Heaven Evening, and yesterday, The Day of the Blizzard. It was an amazing day. As it was, I was craving a Great Big Blizzard and something akin, though a foot to shorter than I would have liked, fell from the sky. What a gift! Early in the morning several friends called to warn me about leaving the house. You're not twenty you know. Another said, promise me you will bring along a cane when you go out. Still another warned of 55 miles an hour wind. Two years ago I went hiking in the Alps to 3 days. Again, an elderly worrying friend, on a walker and residing in an Independent Senior Citizen Complex which she never leaves, asked me, Can you really do this? My answer was, I will find out. And I did! And again, I had the best time of my life. I am a firm believer that once you stop doing something, you stop doing something. The fact that my health is relatively OK for a soon to be 14 year old allows me to hold on to this thought, in both mind and practice. Yesterday I was scheduled to see a 2 PM Broadway Matinee of My Mother's Brief Affair with Linda Lavin. 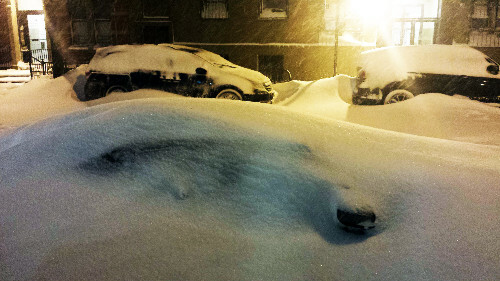 A couple of friends that I invited to go with me cancelled out after looking out of their window and seeing snow. However, my adventuresome neighbor Marina was surprisingly game so off we went, carefully of course. I had planned that if the subway was not working, the buses had already stopped at noon, that I would walk to 2 miles. In fact this is what I really wanted to do. Alas, we did subway. both up and back, as the subway continue to run throughout the day. So yesterday -- the day of the Not So Big NYC Blizzard, this despite news accounts of 2 plus feet of snow -- Marina and I, carefully negotiating large snowdrifts, uncleared sidewalks, and near-empty streets, made our our way uptown. A block from the theater another friend called to say the Governor Cuomo (or was it our mayor?) 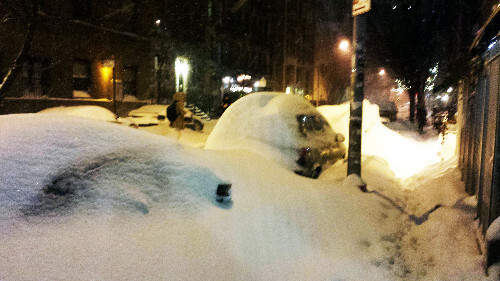 ordered all cars off the street by 2:30, and urged restaurants, and Broadway Shows to close, as the subways might be closing at 4 PM and everybody would be stranded. When we got to the box office the lady said they just got a notice that they were to close, as were all Broadway plays, 15 minutes ago. Here we were playless in midtown. So I decided that now that we were here in midtown that we should find a place to have a drink and have a bite to eat. So off we tottered over to restaurant row on 46th Street with the hope of popping into Joe Allen's which as it turned out just closed, as did most of the restaurants on the block. We did an about face, turned around to proceeded to find a restaurant that was open. Walking down the block passing the Off Broadway St. Luke's Theater where Ruthless! The Musical was playing I decided to check to see if they were going on with the show and lo and behold, if by magic, they were. As luck would have it there were a great many cancellations for Ruthless and they were more than happy to give us two press tickets...center seats in the 2nd row. The theater, with a less than two hundred seats, is an intimate one, always welcome, more so if the play is wonderful. Ruthless was great fun. Due to our seats and the size of the theatre we felt like the play was being performed especially for us and in our own living room. Two of the actors actually blew us away. Both eleven year old Tori Murray playing Tina Denmark and Kim Maresca playing Judy Denmark, her mother, gave star-making performances. We loved the direction, the set, the costumes, the story, and the cast's obvious joy in having any audience at all. The rest of the afternoon and evening I couldn't help laughing at this whole adventure, the trip back and forth, the climbing over mounds of snow, the cancellation or My Mother's Brief Affair - we will be rescheduled and email from the PR lady that arrived to late to stop us from going uptown - the closed restaurants, and the serendipitous finding of the one play that believed That The Show Must Go On. God Bless Them! After we got back home we had early a drinks and supperfest at Via Della Pace one of the few restaurants - one block from my apartment - that was open in the neighborhood. It was sparsely inhabited, lit by candles, and was so visually inviting. We felt we were in the country. We took the best table in the house, table 9, a corner, 3-top, booth that allowed us to see everything - which is always my want - next to a roaring fireplace, we dined like the King & Queen that we are.) As the sun set, allegedly, as it was still snowing and the sun was hidden, people slowly sauntered in to Della Pace. By the time we left it was filled with other grateful people. So this was my wonder-filled day, my wonder-filled evening, my wonder-filled life.